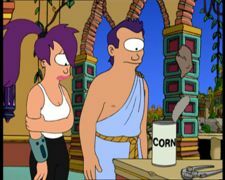 Leela with Alcazar, who altered his appearance to look like a "cyclops"
A lyric from the song "Daisy Bell"
"A Bicyclops Built for Two" is the twenty-second episode of Futurama, the ninth of the second production season and the thirteenth of the second broadcast season. It aired on 19 March, 2000, on Fox. While searching for her origins, Leela runs into another lost cyclops, Alcazar, but his story may not be what it appears to be. 1.1 Act I: "We're online!" 1.2 Act II: "Look at that statue, it's only got one eye." 1.3 Act III: "It's time for this bird to walk!" After trying and failing several years ago, the Professor finally connects to the Internet through AOL. Everyone except the Professor logs in to the virtual world. After fighting many ads flying around, they visit the "Filthy Chat Room" and the "Filthy Filthy Chat Room". Later, they eventually come together in a "video game", Death Factory III: The Legend of Death Factory II. Inside the game world, they fight each other by shooting lasers with their fingers. Farnsworth appears some times to tell the crew they have a popcorn and soda delivery to Cineplex 14, but they ignore him. When looking for Fry, Leela meets another cyclops, but Fry kills his character and wins the game, preventing Leela learning about her species. On the delivery, Leela receives an email from Alcazar, the other cyclops, who invites her to their home planet. The crew dumps their cargo, which drifts into the sun of the destination planet, creating a popcorn nebula. Act II: "Look at that statue, it's only got one eye." The crew arrive on the planet, where Bender immediately sets about stealing Alcazar's possessions. Alcazar takes Leela to see the ruins of the planet, which include a mosaic of their goddess of beauty (who looks like Leela), The Forbidden Valley, a holy sanctuary where no one may tread and Alcazar's giant castle. Leela asks Alcazar what happened to their people, but he says it's too painful to speak of. At night, Leela hears Alcazar crying. Alcazar tells Leela about her heritige. He tells of their people's demise when the "Eyeless Mole People" of "Subterra 3" shot missiles to the planet because they were jealous of the visual ability of the Cyclops and tells her that they shot lots of missiles hoping to destroy Cyclopia and, unfortunately, one of the missiles destroyed the planet. Alcazar and a baby who was rescued and sent to the Earth were the only survivors. Leela tells him their species will not end with them, and they start to make love. The next morning, Alcazar, or "Al", soon begins to show his true colors as a lowlife jerk and their romance turns into an episode of the crude, late-1980s live-action FOX sitcom, Married...With Children (with Leela's voice actress, Katey Sagal, more-or-less reprising her role as Peg Bundy in the form of Leela dressing as Peg and trading ribald insults about hygiene and sexual prowess with Alcazar while his grubby friends hoot and laugh). In spite of this, Leela decides to try and continue the species, and Leela and Al get engaged. Fry is upset, and attempts to search The Forbidden Valley, but falls into the dungeon in the process. Act III: "It's time for this bird to walk!" The rest of the staff arrives for the wedding. Fry escapes from the dungeon, and he and Bender search the forbidden valley. They find that it holds four identical castles, the first they visit has cyclops statues replaced with 5-eyed-aliens. Meanwhile, back at the wedding, Preacherbot holds the ceremony, and asks Leela if she will marry Alkazar. However, just as Leela is about to say "I do", Fry and Bender burst in with Alcazar's other fiancées. He is revealed to be a shape-shifting grasshopper-type-alien, who is using the same story to wed several lonely aliens. All weddings are called off and Leela continues wondering where she's from. The Professor tells her she has plenty of time to search while she pays back for the popcorn and soda shipment she destroyed. The video game played by the crew is "Death Factory III: The Legend of Death Factory II". To make room for more stolen items Bender dumps his goldfish bowl, toaster and two more goldfish bowls. This episode won an Emmy, outstanding colour direction for Bari Kumar. This episode was named #8 on TV.com's list of Top 10 Futurama Episodes. David X. Cohen and three other crew members appear as internet nerds. In "Love's Labours Lost in Space", Leela says she doesn't care how many eyes a guy has as long as it's less than five. One of Alcazar's forms has five eyes. Prof. Farnsworth: Good news, everyone! Several years ago, I tried to log on to AOL, and it just went through. Whee! We're online! Prof. Farnsworth: Go ahead, get into these net suits. I designed and tested them myself. Leela: [She sniffs her glove.] They smell like burning Rhesus Monkey. Prof. Farnsworth: Really? I guess when you're around it all day you stop noticing. Off you go. Alcazar: [voice-over] It wasn't long ago. Our people were happy and prosperous, [The flashback cuts to a dark planet with rocky terrain and lots of large molehills.] but the eyeless mole people of Subterra 3 grew jealous of our visual prowess. They fired missile in all directions hoping to hit Cyclopia. [A mole man presses a button and several hundred missiles are launched from the planet.] Unfortunately, one of the 40 planets hit... was ours. Cyclops #1: How far away do you think it is? Alcazar: Well, this is the real me. But I can explain: We all have needs. Mine was to make it with five weirdos and have them scrub my five castles. I gave you all what you wanted and of course I made a few bucks letting Pig watch through the two-way mirror. Can any of you say you wouldn't have done the exact same thing in my position? Lightspeed Briefs, which Leela is seen hanging to dry in this episode, makes its first appearance. Bender sings "Daisy Bell", which is referenced in this episode's title. The title of the episode is a reference to a lyric from the song "Daisy Bell". The playing of "Also sprach Zarathustra" when the Planet Express crew logs on to the Internet, and Fry's line "My God, it's full of ads!" are references to 2001: A Space Odyssey, both book and film. Fry's line refers to Dave Bowman's exclamation "My God...it's full of stars...". Hermes dodges a pop-up ad the same way Neo dodged bullets in The Matrix, which he is able to do because he is a former limbo champion. The appearance of the internet is based heavily on its description in Neal Stephenson's novel Snow Crash. The virtual reality also has some allusions to Tron. The scene with Alcazar and Leela on the couch is a reference to Married... with Children (which had Katey Sagal as Al's nagging, lazy wife, Peg, who had her hair in a bouffant and wore tacky clothes, like stiletto heels, clam digger pants, and skintight tops). Alcazar's sleazy friends whooping over the sexually suggestive dialogue is a reference to the actual Married...With Children audience doing the same. Donkey Kong appears in Death Factory III. Previously, he was parodied in the cold opening of "Space Pilot 3000". He is also seen in "Anthology of Interest II" and "The Devil's Hands Are Idle Playthings". The Professor's head appearing as a giant blue hologram is most likely a reference to Emperor Palpatine's appearance in Star Wars Episode V: The Empire Strikes Back or a reference to Zordon from Mighty Morphin Power Rangers. A Macintosh style menu is used by Bender when selecting a disguise. One of the alien beings Alcazar transforms into is a Yithian from H.P. Lovecraft's "The Shadow Out of Time". The music for the video game sequence, when the crew fights each other online, is from the early 1970's video game Space Invaders. The scene with a baby being shot into space from a planet about to be destroyed is a reference to Superman. Towards the end, Leela asks, "If you could change form, why didn't you change it in the one place that counts?" The shot with the crowd laughing shows Fry with four arms. When Alcazar's true form shows, his top left arm meshes into his face for a split second. This page was last edited on 1 November 2017, at 05:04.